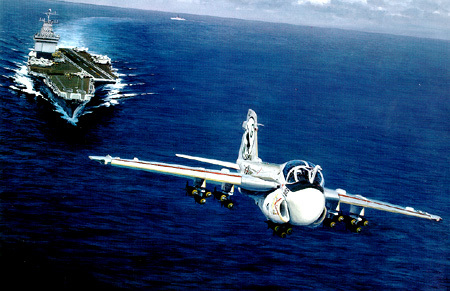 Image Size: 28" x 18-1/4"
The image is bright and clear: an A-6 Intruder jet aircraft taking off from the deck of USS Enterprise. But the story behind this aviation art is one of consummate courage in the face of incredible adversity, because the pilot is Navy Captain Eugene "Red" McDaniel, the place is the Gulf of Tonkin, and the date is May 19, 1967--ironically Ho Chi Minh's birthday. An additional 500 have been donated to the American Patriot Fund.